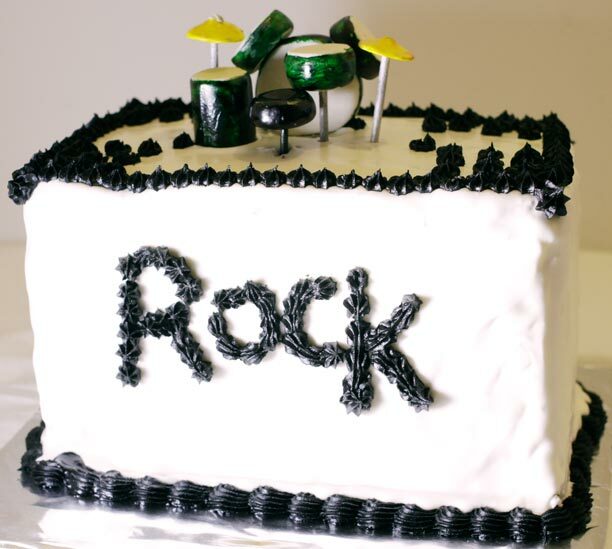 Week #5 – Happy Birthday! This weekend was my birthday. 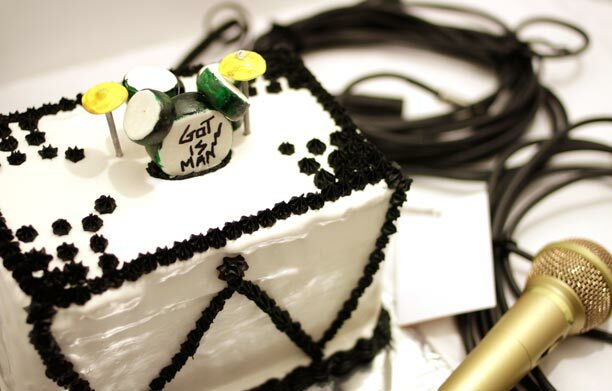 It was also my friend and drummer, Dan’s birthday (he also happens to be an amazing photographer). So rather than make myself a cake, I decided to make a cake to celebrate the birth of my friend. He had mentioned a bakery back in New Jersey where he used to get cakes as a kid. These cakes were devil’s food cake, filled with custard and topped off with boiled icing. None of those are things I have done before so – I gave it a shot. The devil’s food was pretty easy and I kicked it up a notch with some chocolate chunks inside. 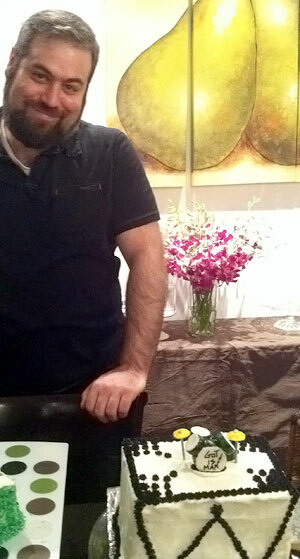 The cake came out pretty well, maybe a tiny bit dry but I fixed that with a simple syrup bath while stacking the cake. The custard was ok. It came out a bit runny and I didn’t make enough of it for the whole cake so I had to supplement with buttercream. Still yummy but not exactly what he wanted. The boiled icing was an interesting experiment. Basically boiled icing is like royal icing in texture. It’s made with egg whites, sugar, corn syrup and vanilla extract. When it dries, it dries hard and crusty and a bit shiny. So basically it coats the cake. It’s very sweet and sugary. 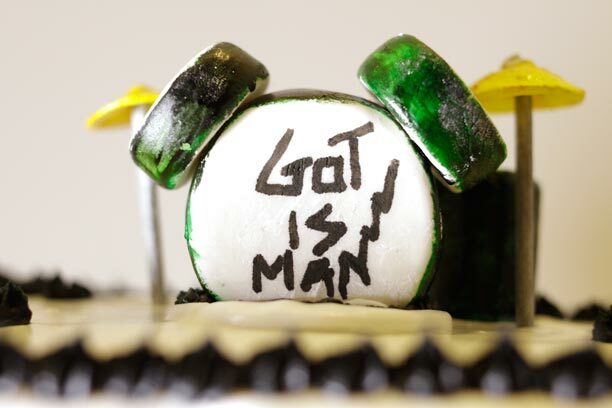 When the cake was done I thought it looked a bit plain so I made a gum paste drum set and painted it to look like Dan’s drums (I also put the fake name (Gottesman = Got Is Man) of what I think his metal band should be on the drums). I also made some decorations with black decorator’s icing. All in all the cake came out really cute and was really tasty. Next time I would make a more moist chocolate cake and I think I wouldn’t make it so damn big.